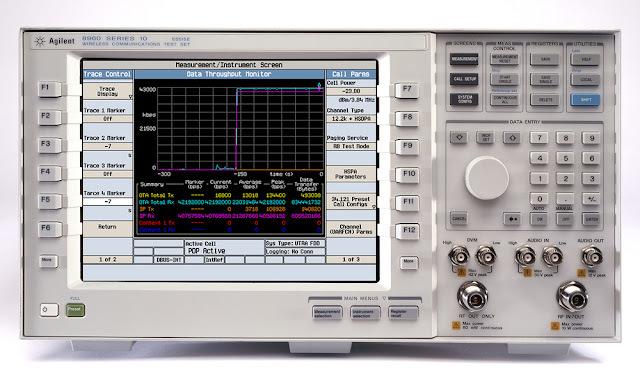 Agilent Technologies Inc. (NYSE: A) recently announced the new E5515E 8960 Series 10 wireless communications test set, designed for R&D engineers who need to stress their 2G/3G/3.5G designs at the maximum data rates. The E5515E, an enhancement to the industry-preferred 8960 wireless test set, is equipped with dual downlink paths, a more powerful processor and other significant hardware improvements. It includes advanced features such as sustained 42-Mb/sec DC-HSDPA throughput and extensive handovers between 2G/3G and LTE, for comprehensive 2G/3G/3.5G/LTE testing together with the Agilent PXT E6621A wireless communication test set for LTE. In addition, the E5515E wireless test set supports the latest TD-SCDMA advancements such as TD-HSDPA 2.8-Mb/sec IP data connections, TD-HSUPA signaling and test-mode connections, and TD-SCDMA protocol logging. "With dual RF downlink paths, greater processing capability and more memory, the new E5515E is equipped with even more power to meet the challenges of 3.5G wireless device development," said Garrett Lees, marketing manager of the Mobile Broadband Operation at Agilent. "The two downlink paths allow testing of DC-HSDPA at the maximum 42-Mb/sec data rate and support testing of future multiple-output technologies." The E5515E wireless test set is designed to meet the ever increasing demands of the wireless R&D segment of the mobile broadband industry. It complements the currently available E5515C, widely used for both R&D and high-volume manufacturing test. The E5515C continues to offer robust, repeatable and standards-compliant 2G/3G/3.5G RF measurements for both R&D and manufacturing. Existing E5515C test sets can be upgraded to E5515E hardware to support the latest 3.5G technologies such as 42-Mb/sec DC-HSDPA. Additional information about the Agilent E5515E 8960 Series 10 wireless communications test set can be found at www.agilent.com/find/E5515E. Product photos are available at www.agilent.com/find/E5515E_images.